Here’s another edition of my Forex Trading Guide! This time, let’s take a look at TWO major events that could push pound pairs around tomorrow. When it comes to employment gains, the U.K. economy is definitely on a roll! The number of claimants has been dropping faster than expected for the past three months, pushing the U.K. jobless rate down from 7.2% to 6.9% as of March. With that, U.K. Chancellor of the Exchequer George Osborne recently remarked that the strong jobs data is proof that the government’s economic plan is working. For the month of April, claimant count is expected to drop by 30.4K while the jobless rate is projected to dip to 6.8%. 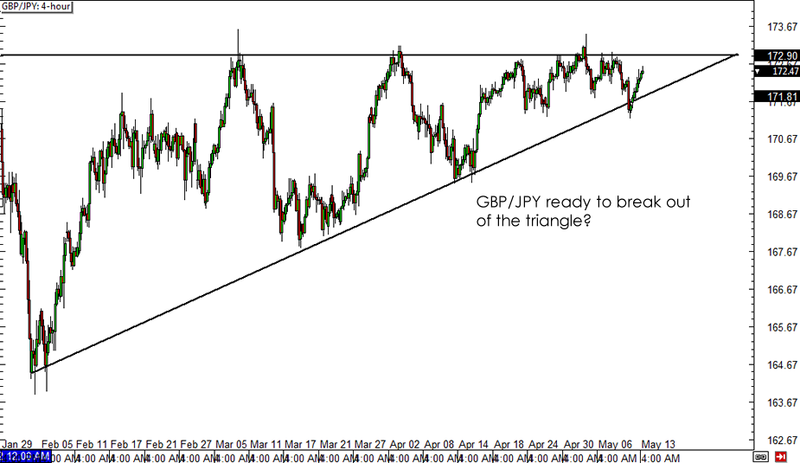 Another stronger than expected reading could allow GBP/USD to resume its uptrend or even push for an upside triangle break for GBP/JPY! The other economic event that could usher in extra volatility for pound pairs in tomorrow’s London trading session is the BOE inflation report. This quarterly release contains the central bank’s GDP and inflation forecasts, with upgraded estimates likely to spur talks of a potential BOE tightening again. Remember that BOE Governor Carney has mentioned that the central bank might be ready to hike interest rates before the U.K. general elections take place next year. Of course this still depends on whether or not actual economic figures support a removal of monetary stimulus in the near future. The latest set of data revealed that growth could pick up but that annual CPI remains below the central bank’s 2% inflation target, which Carney claims to be a “dangerous distraction” in evaluating economic progress. Take note that Carney has a speech lined up after the release of the BOE inflation report, which means that pound movement could be very sensitive to his remarks around that time. Are you planning on trading any of the pound pairs during tomorrow’s U.K. events? Share your trade ideas in our comment box or cast your votes in our poll below!